Philip Alston said the government's welfare changes and council cuts are causing "misery"
The United Nations Special Rapporteur on Poverty and Human Rights has slammed the UK government’s “cruel and inhuman” austerity programme and welfare reforms. “What I saw at food banks, schools, community centres, job centres, libraries and elsewhere is a lot of misery. A lot of people who feel that the system is failing them, a lot of people who feel that the system is there to punish them. He was particularly critical of changes to the benefits system which have pushed people into poverty. Alston said these changes were ideologically-driven and that ministers were in “a state of denial” about the misery they’re causing. One example is the new policy of only giving families benefits for two of their children. This has cost 70,000 low-income families nearly £3,000 a year. Alston also said that the welfare changes were damaging women more than men. “I think if you had got a group of misogynists in a room and said ‘guys, how can we make this system work for men and not for women’ they wouldn’t have come up with too many other ideas than what is already in place. Over 90% of lone parents are women. So which group do you think does absolutely worse in the whole benefits system? Lone parents. One way in which women are put in danger by the welfare reforms is that Universal Credit is paid to a household. “The impact on many women is extremely problematic. They are not able to control the family income, the male in the household dominates and it puts them at greater risk of domestic violence. Well, it would be interesting to see what the figures are for women living in poverty, whether they have joint bank accounts. Most of them don’t have joint bank accounts because they’re solo, even if they’re living with someone. [Mcvey] also went on to say ‘well if they’re having problems, they should get counselling and if things are really bad, they should leave. “I heard many stories on the Daniel Blake line that ‘well I was asked to snap my fingers and I could and I was asked if I could put my hand on my back and I could and at that stage I was told ‘great, fit for work’. Alston said that GPs either didn’t want to provide the medical advice proving they’re not fit to work or wanted £20 or £30 to provide it – which is more than many people on benefits can afford. 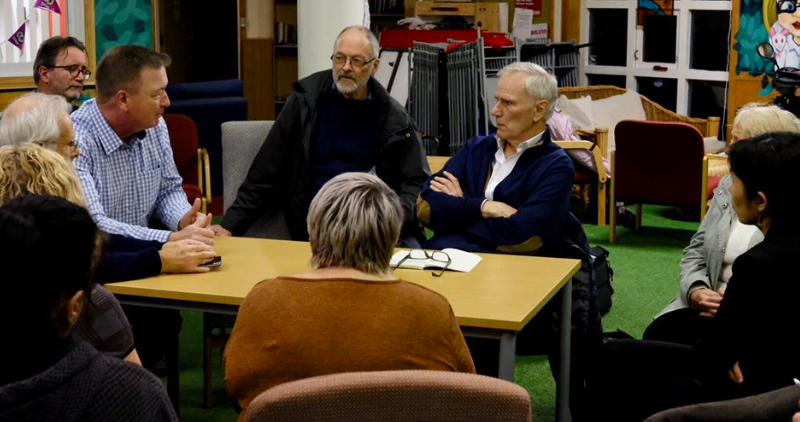 Alston also said that welfare changes and austerity have made the issues of loneliness and poor mental health worse, particularly for elderly people. Due to council’s budgets being cut by nearly 50% on average, community facilities have disappeared and cuts to benefits mean people can’t afford to catch the bus to meet friends. Asylum-seekers are another group of people often living in poverty. Alston joked that, as an Australian, he shouldn’t talk about inhumane asylum policies as his country holds the “world record”. However, he said that expecting asylum seekers to survive on £37 a week, without being able to work and without any government services is “entirely unrealistic and very punitive”. He said that the government should consider allowing asylum seekers to work, as the UK has low unemployment and could therefore easily accommodate more workers. Looking to the future, he said that Brexit would damage the economy and that the poorest in society would be hardest hit by this. He implied this was ironic as many commentators have claimed austerity helped cause the Brexit vote. After a devastating twenty-minute critique of Tory policies, Alston ended his press conference on a positive note. Joe Lo is an investigative journalist and writes for Left Foot Forward. Follow him on Twitter.